High, low, right and left. 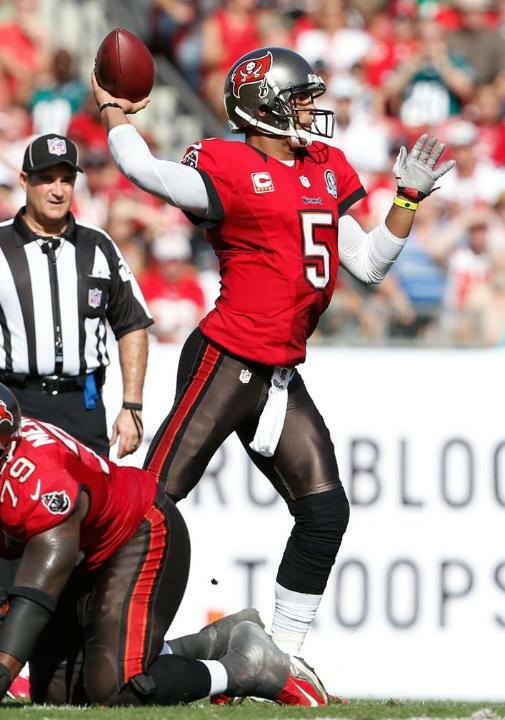 Everywhere Josh Freeman tried to throw, it seemed, many of his passes fell off target. The Buccaneers' quarterback struggled during Sunday's 23-21 loss to Philadelphia as the once-potent Tampa Bay offense was shutout in the first half and failed to produce enough points to win. Freeman had one of his worst days of the season – at least statistically – against an Eagles team that had given up 28 points or more in six consecutive games. Freeman completed just 14 of 34 passes (41.1 percent) for 189 yards, with two touchdowns and non interceptions for a 79.2 passer rating. In the first half, especially, Freeman looked out of sync with his receivers and missed his target on several pass attempts, completing just 5 of 16 for 61 yards and a quarterback rating of 44.0. At halftime, Tampa Bay trailed 10-0. The poor performance had the fans booing as the team headed off the field. Freeman looked better to start the second half. He threw some strikes – including zipping in a 1-yard touchdown pass to Mike Williams and a 13-yard scoring pass to Vincent Jackson to put Tampa Bay in front early in the fourth quarter. Freeman appeared to be on track, completing 9 of 18 throws for 128 yards in the second half, including a 40-yard pass to Jackson deep down the middle.